Five Oaks Press, 9781944355340, 102pp. 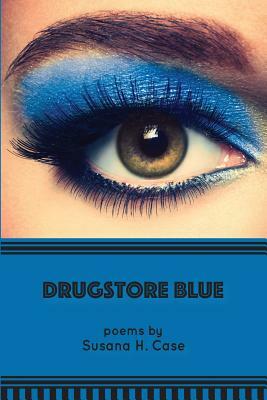 "In Drugstore Blue, Susana H. Case's speaker is a femme fatale in serious eyeshadow: 'You need me / like a tongue needs a second / mouth.' That's the sound of her craft, one of her dart-like declarations, hitting its mark. Rarely has makeup, and the color blue, in particular, come alive on the page like this: 'Blue all the way to the brow, an eyelid / tin-glazed, / underglazed, / sancai lead glazed, / oxide blue glazed, / a glaze of blue not born of the blues, but the antidote, / spring blue, felice blue, / green dragon constellation blue, / occult knowledge blue, / the eye of God.' Need I say more? Her poetry reads like a graphic novel, a romp, a road-trip in a borrowed car, speeding with a wild child at the wheel. Vivid, direct, episodic, and utterly believable, Case's tropes make excellent landings. From Morandi to Velvet Elvis, from Marrakech to Cartagena, eros is never far off, and her text glitters on the page in a poetry of great precision."